Sutton Place is a community of 80 condos, 40 villas & townhomes, and 40 mid-rise units where the community lifestyle embraces tranquility, natural beauty and endless opportunities for culture and recreation in a waterfront setting. 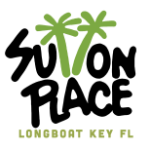 Sutton Place is located on Longboat Key off the shores of Sarasota, Florida and is an impeccably maintained and friendly community of townhouses and condominiums. Sutton Place offers two beautiful pools, a sixteen-slip marina with boat docks available for a nominal fee, and a private beach access pavilion right across the street, with lockers and showers and benches from which to watch sunsets over the gulf while sipping a delightful beverage. If you enjoy nature watching, bring your camera! You will see bottlenose dolphins from our bayside seawall and gentle manatees will often swim right into the marina! There are also egrets, ibis, pelicans, herons, ducks, kingfishers and too many other bird species to list. There is outdoor kayak storage, a clubhouse you may reserve for gatherings and so much more. The grounds are among the most beautifully maintained on the key and the mid-island location provides quick and convenient access to Sarasota and Bradenton.